1) You can start the order from Clover Customers, Salon Scheduler or Register. 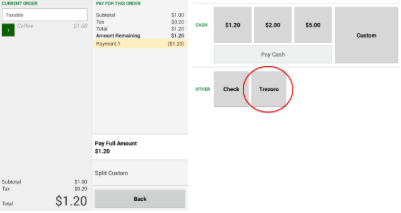 Take the order on your Clover device as you normally do and press pay. 2) BEFORE closing out the sale launch the Trezoro app, if you are using Clover customers the account will be pre populated, if you start the order in register search for and select the customer. 3) Press SELECT at the bottom of the screen. You will be returned to the payment screen. 4) Close out the sale, once the purchase is complete the points and punches will be automatically added. You will see a small confirmation message flash up on the screen.